"Nothing! Absolutely nothing! Stupid! You're so stupid!" says the game show host of Weird Al's classic cult film UHF . And that couldn't be more right about what's in most processed foods--nothing nutritious at least. The Zone Diet taught me to look at Protein, Fat, and Carbohydrate content for anything with a label, but it was through the Paleo Diet that I first started looking below those numbers to the sea of ingredients. And boy were my eyes opened! Does Taco Bell's beef meet the minimum requirements set by the USDA to be labeled as "beef"? 3-5% spices (including salt, chili pepper, onion powder, tomato powder, sugar, garlic powder, cocoa powder and a proprietary blend of Mexican spices and natural flavors). 3-5% oats, starch, sugar, yeast, citric acid, and other ingredients that contribute to the quality of our product. Do YOU have to use grain-derived additives and sugar to enhance the quality of the taco beef you serve at home? Has your beef been treated with ammonia? With the U.S.D.A.’s stamp of approval, the company’s processed beef has become a mainstay in America’s hamburgers. McDonald's, Burger King and other fast-food giants use it as a component in ground beef, as do grocery chains. The federal school lunch program used an estimated 5.5 million pounds of the processed beef last year alone. But government and industry records obtained by The New York Times show that in testing for the school lunch program, E. coli and salmonella pathogens have been found dozens of times in Beef Products meat, challenging claims by the company and the U.S.D.A. about the effectiveness of the treatment. Federal officials agreed to the company’s request that the ammonia be classified as a “processing agent” and not an ingredient that would be listed on labels. Is a Happy Meal a Crime? WASHINGTON—A mother of two from Sacramento, Calif., says that McDonald’s uses toys as bait to induce her kids to clamor to go to McDonald’s and to develop a preference for nutritionally poor Happy Meals. With the help of the Center for Science in the Public Interest, today the mom, Monet Parham, is filing a class action lawsuit aimed at stopping McDonald’s use of toys to market directly to young children. Read more on this class action lawsuit at the Center for Science in the Public Interest. Has your town outlawed marketing that uses toys to lure children toward unhealthy food choices? San Francisco has! Under the law, McDonald's and other restaurants will have until December 2011 to improve their meals' nutrition by adding fruits and vegetables -- if the chains want to keep offering toys, including those promoting the latest films. Can you trust your food isn't genetically modified? harmful to life. If it isn't enough that it harms other plants and animals, it also harms us. Roundup is toxic to farm workers too and those whose homes are rooted downwind of the sprayed fields. So, this crop is pretty scary, right? Scarier still is the fact that it was just deregulated by the Agriculture Secretary--meaning it has the green light, which opens the floodgates for genetically engineered superplants to become commonplace. And unfortunately our loudest, strongest voice against this onslaught turned tail and gave in. Big Organic including Whole Foods Market, Organic Valley, and Stonyfield Farm would rather "coexist" with Big Agro instead of fight them anymore. Here's one news article from Bloomberg BusinessWeek on the decision. Concerned? Do something about it and contact President Obama. Read more at The Cornucopia Institute. If you can't pronounce an ingredient and it has no "otherwise known as" modifier to something you actually recognize, DITCH IT! Find foods with FEW ingredients! If even a label at all! Shop the PERIMETER of your supermarket for the freshest and least ingredient-laden foods. Notice there aren't any ingredient labels on your fruits and vegetables and there shouldn't be anything except meat and fish on meat and fish labels. Buy ORGANIC whenever possible. You don't want or need the chemical load of non-organic food. Heck, even organic might be in question soon. Worried about the expense? Worry more about the health risks you are taking by saving a buck. Shop LOCAL. Shop at your farmer's market to find local, seasonal produce. Support local ranchers raising their animals on pasture. You can find great sources for these at Eat Wild. Buy LOCAL FARM eggs whenever possible and free-range, cage-free, pasture-raised, certified humane, organic, omega-enriched when store-bought. Buy WILD-CAUGHT, SUSTAINABLE fish. Use the the Seafood Watch guide to guide your choices. Buy GRASS-FED, pastured, and organic meat and dairy products. What's healthiest and happiest for the animals is for you too. 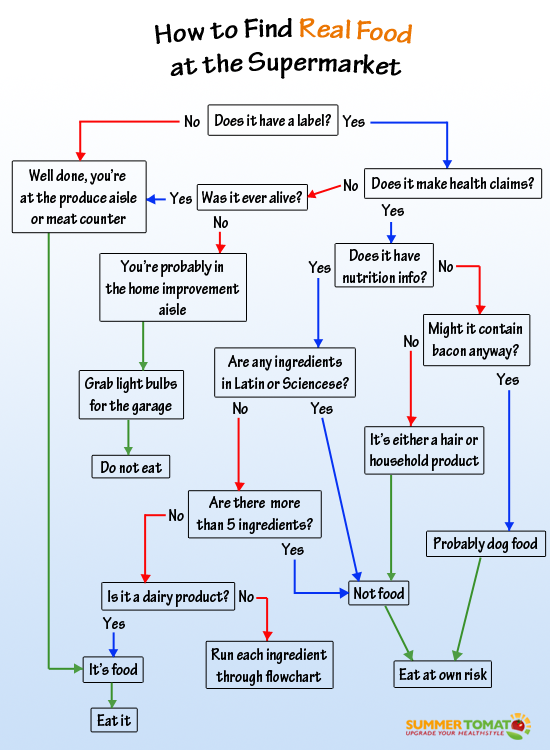 For a laugh, check out this flowchart from Summer Tomato to decipher whether your food is Real Food. Food can be a tremendously stressful situation for us at every single meal. But it doesn't HAVE to be! Choose REAL FOOD choices as much as possible to do your body and the world some good. Starting to be more mindful of what you are eating and what your food is made of starts you on the road to taking control of your diet. Try to nourish yourself, not harm. Find me and many other paleo bloggers on our weekly Paleo Rodeo hosted by Modern Paleo!